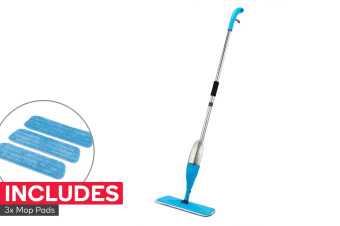 Read customer reviews of the Kogan UltraSwish Spray Mop with 3 Mop Pads. After a purchase, we invite our customers to leave a product review. The customer reviews for Kogan UltraSwish Spray Mop with 3 Mop Pads are below. Just wonder how robust it will be with lots of use. Well made and light and easy to use. Great value. Love it and will buy more for gifts. Did not expect better quality for the price seeing it is made of very lightweight materials, but it works fine for my requirements. No problems with quality of product. We have used the Spray Mop on tiled flooring it made cleaning an easy task without leaving any messy marks. I tried the mop the after it arrived and it beats any steam mop hands down great product. The mop doesn't work if the trigger is pushed too hard doesn't snap in properly but I can get it to work so it does the job.